This piece originally appeared in the Yale ISM Review. “As an American Indian, all my life I have been cursed with the myth of the ‘Indian rain dance,’” Johnny P. Flynn wrote in Religion Dispatches in 2012 when the United States Agricultural Secretary, Tom Vilsack, suggested a rain dance to end a drought. “I am here to say there is no such thing. Not in my Potawatomi tribe or in any other tribe across the Americas.” Weather-related rituals, Flynn wearily pointed out—including the Hopi’s famous late summer dances—recognize the season rather than bring on the rain. That hasn’t stopped some from trying. 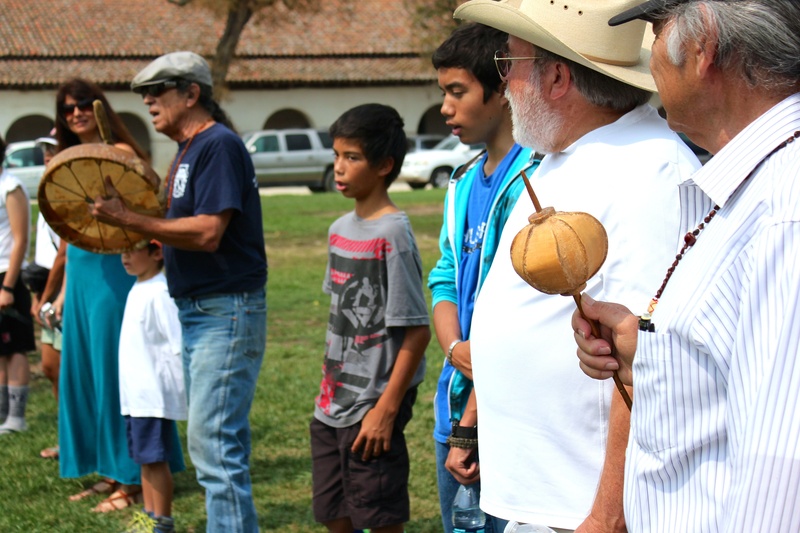 On a hot September day, while wildfires raged two hundred miles to the north, a motley crew of rain dancers gathered on the lawn outside of the San Juan Bautista Mission in Central California. A few of the dozen participants claimed Native American ancestry, but most did not. They wore everything from long floral dresses to athletic shorts. Each carried a bottle of water. Sonne Reyna, who said he grew up participating in ceremonies as part of the Lipan Apache and Yaqui tribes, instructed the group to line up facing west. They took a bit of tobacco—the messenger to the Creator, Reyna said—and tossed it into the wind. Standing at the center of the line, Reyna beat his drum and led the group in song. With laughter, each tossed water from their bottles as an offering, and then turned to the south, repeating the process in each cardinal direction. The group started holding rain dances in 2014 and promised to keep on going until California’s drought ended. Native or not, weather-related rituals can raise questions about God, the world, and our place in it. Indeed, a tension exists across traditions in the way people understand what it means to pray for—and sometimes receive—rain. Some see it as a magical solution or an exercise in trusting God, while a modern understanding of climate colors others’ approach to such traditions. The Jewish people also have an ancient connection to the land, although their homeland is far from California. Reform Rabbi Ron Stern of Stephen Wise Temple in Los Angeles agrees with Reyna that Jewish traditions come out of indigenous cultures. “As modern scholarship understands it, [Jewish holidays] are originally days that pagans recognized as holidays associated with the rain fall, and Judaism layered meaning on top of it,” Stern said. This line is optional in the Reform tradition. “The ancient notions of God as kind of a superhuman, supernatural being that maneuvers the world are just not tenable in our day and age,” said Stern, who gave a sermon in February 2014 about why modern Jews don’t pray for the rain. Still, if this Jewish tradition fits anywhere outside of Israel, it’s California, where a Mediterranean-like climate mirrors that of Israel, with dry, hot summers and mild, wetter winters. The Talmud lays out a plan if the rains do not come, starting with fasts by the leaders and progressing to fasts by the community. The process is optional after the fall of the temple in Jerusalem. A few Oakland rabbis, including Rabbi Mark Bloom of the Conservative Temple Beth Abraham, decided to give fasting a try anyway, in January 2014. After his fast, it poured rain, Bloom said. His congregation was energized by the experience. “The mystically oriented people like that we’re actually confronting prayer head on and trying to talk openly about our relationship with God. Rationalists like it also because it talks about resources, the environment and helps us concentrate on that,” Bloom said. The Talmud says that, once it rains, the fast should end. Last winter, a group of youth skipped over the rabbis and fasted by themselves. December was rainy, but it didn’t continue. In 2015, Bloom said, the congregation plans to adapt the ancient rules and continue its fasts throughout the rainy season. The Islamic Society of Orange County also tied fasting and prayer into their overall response to the drought, promoting a “green” Ramadan this year. “I told the people, ask God for rain, pray for it, but don’t waste water,” said Muzammil Siddiqi, the center’s religious director. The tradition comes from the Hadith, or sayings of the Prophet. During the Prophet Muhammad’s Friday sermon, somebody told him that people and their animals were suffering and dying from the lack of water. He asked the Prophet to pray for rain. The sky did not have even a speck of clouds, but after the Prophet prayed, clouds immediately appeared and it started to rain, the story goes. As it did for rabbis, it poured for the Muslims, following the Eid prayers, setting records for July, when rain is typically nonexistent in Southern California. Imam Mohammed Zafarullah of the Ahmadiyya mosque in Chino Hills, east of Los Angeles, saw the same storm system as a result of his mosque’s interfaith prayer event a few weeks earlier. An extension of their long-standing interfaith relationships, the mosque invited Catholic, Buddhist, Hindu, Sikh, Mormon and Christian Scientists to perform and explain their rain prayers with them. But if God brings rain, did God also bring the drought? Brian Malison, a pastor at Christ Lutheran Church in Visalia, California, simply isn’t sure. “I don’t know anyone who can really truly answer that question,” he said. His church is in the Central Valley, an agricultural area dependent on snow pack from the Sierras and groundwater from wells. In two weeks this summer, fourteen wells ran dry in Tulare County. One of his member spent $40,000 to drill a 300-foot well. Some have talked about moving to the city water grid for relief. People may not voice their uncertainty in religious language, but the subtext is “Where’s God in the midst of all of this?” Malison said. For Stern, that’s not a concern; the weather is the weather. Bloom, on the other hand, emphasizes our insignificant place in a huge universe. Like Zafarullah, he counsels humility. Still another approach, grounded in biblical texts, is to explain the lack of water as a consequence of sin. “If you faithfully obey the commands I am giving you today—to love the Lord your God and to serve him with all your heart and with all your soul—then I will send rain on your land in its season,” reads Deuteronomy 11:13–14. The passage from Deuteronomy is also in the Jewish liturgy, but it has been removed from the readings in the Reform tradition, Stern noted. Nevertheless, despite his skepticism about praying for rain, there is a sense in which he agrees with the biblical account. The Catholic Church has long been vocal on the consequences of climate change. Pope Francis elevated the issue as a priority with his encyclical Laudato Si’: On Care for Our Common Home, which agrees with the scientific consensus that human activity affects the climate. We realize now, looking up into the clear, blue sky, what a marvel even the least drop of rain really is. . . . Look to our dry hills and fields, dear God, and bless them with the living blessing of soft rain. In presenting the prayers, the California bishops drew from The Compendium of the Social Doctrine of the Church, a document of the Pontifical Council on Justice and Peace, to explain their perspective. Water is a gift from God, the document affirms, and a resource we are morally obligated to protect and share with all people, especially those who are poor. The Catholic approach balances “our dependence on the Creator” with our call “to be good stewards,” Soto said when he released the prayers. Prayer reinforces stewardship, said Sister Anna Keim. At Ramona Convent Secondary School in Alhambra, California, just outside Los Angeles, Keim teaches water conservation to her freshman students. On World Water Day on March 19, the students gather to pray about water. This fear—of a strong El Niño winter bringing too much rain to California—contributes to his congregation’s uncertainty. Although another year of drought would devastate the Central Valley, flooding also could hurt farmlands, washing away nutrient-rich topsoil. The last strong El Niño, in 1997, caused 17 deaths and more than half a billion dollars in damage in California. A day after the first rain dance of the fall 2015 season in San Juan Bautista, it poured—but not over the dry fields of Central California or the burning valleys of Northern California. The remnants of a tropical storm dumped 2.39 inches of water on downtown Los Angeles in a month when the city typically receives 0.24 inches of rain. Scientists predict that climate change will bring more extreme weather. In California that means less snowpack, longer droughts and heavier storms. “Sometimes the answer . . . is not that we ask God for more of something, but that we’d ask God in wisdom to use what we have in order to be sustainable,” Malison said. The Hadith presents another solution to the prospect of a destructive El Niño. A week after Muhammad asked God for rain, a follower came to him and asked him to ask God to make it stop. “Make it around us, not on us,” the Prophet prayed. Just as quickly as the clouds came, they dispersed. Click here to read the entire issue of the Yale ISM Review on water.